I must say, after the heat wave we experienced during the latter part of June and early July, this cool, rainy weather is a welcome blessing! But I also must say that I am really glad that July Fourth was hot and sunny and gorgeous, in spite of a late thunderstorm in the mountains. For several years now, we have talked of trying to camp at Lake of the Woods for the Fourth of July weekend. Only ten miles away, Lake of the Woods is a high mountain lake that is clean and swimmable. Unlike our magnificent Klamath Lake, filled with birds and ripe with food for them during the summer (aka algae). In fact, blue green algae is harvested on Klamath Lake and sold as an expensive food supplement. My grandmother swore by this stuff, along with liquid chlorophyll, and lived to be 86 eating bacon, chicken fat, pure butter and lots of cream. We have tried several times to get a reservation to camp at Lake of the Woods. There are two main campgrounds, Sunset and Aspen Point. Reservations are allowed at a maximum of six months in advance, so on January 1 I started calling at 8am. Too late. Every single reserved site through July 4th was already taken. A couple of times in the past, we have driven up a few days early to see if the non-reservable sites might be available. Nada. All taken through July 5th. We even tried for the expensive campground at the Lake of the Woods Resort. People must reserve these sites years in advance. Who knows, we have never been able to get any kind of site anywhere at any of the campgrounds around the lake. Maybe it is the fireworks, maybe it is the evening music at the resort, maybe it is just because it is a lovely lake that is boat-able and swimmable and it is summer time. Last year we scouted the entire perimeter of the lake hunting for possible parking spots along the roadway where we could hike into the lake. We found a couple, but much of the lake is ringed by privately owned residences leased by the Forest Service and the shoreline is off limits. Last year with plans to drive the ten miles up the hill after our day at home in Rocky Point to see the fireworks, we decided that dealing with traffic and people and all that was just too much trouble. This year, the Klamath Falls City fireworks show was moved from our lovely Veteran’s Park to the local fairgrounds. Bleachers, dirt, pavement, crowded parking, and crowds. Not even a grassy park to have a picnic or a pleasant place to hang out while waiting for the very late hour of darkness to arrive. No thanks. They even moved the parade from early evening before the fireworks to mid morning. Much too long to wait around all day between the parade and the fairgrounds fireworks, so our little town of Klamath Falls was a no go this year, in spite of the many holidays we have spent there in the past. Once again, we came up with an idea for going up to Lake of the Woods for the fireworks and it worked perfectly. That is the MoHo next to a random truck in a ‘no parking’ spot, and our convenient picnic table. Mo and I got up early on the 4th, and drove the MoHo and a second car to the day use area at Sunset Beach. We arrived just a little bit after 6am, and were happy to see that there were still parking spaces available for boats and trailers on one side and more long spaces that didn’t specifically prohibit vehicles without boat trailers on the other side. 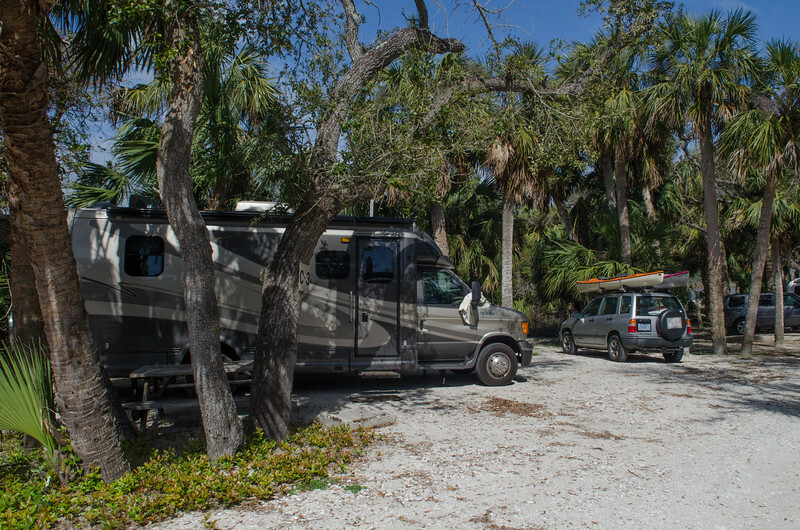 We parked the MoHo in a spot right next to the picnic area near the boat ramp, and staked out our tablecloth on the big picnic table nearby. We then drove back home and loaded up the kayaks on the small trailer and hauled them up with the baby car, leaving the trailer in front of the MoHo. When Melody arrived at the Rocky Point house at 11am, we loaded ourselves into the baby car and drove to the day use area. Of course, by then, everything was jam packed full, and after unloading the rest of the supplies that we brought up in the car at the MoHo, Melody and I parked the baby car in a wide place on the main road and hiked back to the picnic area. The best part about using the MoHo for a day trip was the convenience. We had a refrigerator to keep everything nice and cold. We had our own clean bathroom and a place to change, a bed where Melody enjoyed an afternoon nap, and a place to retreat and wait for the fireworks safe from crowds. The price was perfect! $5. parking reduced to $2.50 with our Golden Age pass was a lot less than trying to pay for an entire week or two of camping just to get a space. The day was perfect. Gorgeous. Blue skies and warm temperatures. It was my first day in the kayak since my surgery, and Mo and Melody obligingly hauled the kayaks down to the beach for me. It was heaven getting back on the water again at last. We had fried chicken, potato salad (of course), watermelon, and chocolate cupcakes to keep us well fed throughout the day and evening. We had our comfortable chairs, the great picnic table in the shade, and lots of entertainment watching the people playing, swimming and enjoying the perfect family Fourth of July day. Later in the afternoon, Melody and I kayaked over to the main resort marina to watch the huge crowds mashed in together along the beach and hear the loud and happy rock music playing out over the water. Everyone was having a great time, and it was pretty noisy and looked like the “in” place to be if you wanted to party. We were extremely happy to be at the other side of the lake! We found out during the day, from a helpful ranger, that the fireworks would be shot off on the southern shore of the lake, and that the trees between us and them would block our view. Ah well. Hiking around a bit for a better viewing site didn’t yield much, so we accepted our losses and decided that hearing them would be enough. As sunset approached, the skies were filled with color and the water was still warm enough for swimming. Lo and behold, once the fireworks started, we found out that we only had to wade out into the water a few steps to see at least part of the huge colorful blooms exploding in the sky. I love the sound of fireworks, and one of my favorite moments of the evening was hearing the incredible echoing of that sound from the opposite side of the lake. It sounded like distant thunder. Amazing. We had already decided to load up the kayaks and hook up the trailer while it was still light, thinking it would expedite our departure. Of course, it did do that, but next year, if we do this again, we will leave the kayaks unloaded and take them out a bit from shore to watch the show. There were many boats on the lake, but not any close up near the dock to worry about, so it would be perfect. On another sad note, most people know that fireworks are deadly for dogs, and we saw a beautiful retriever in the road that had evidently run from its owner in fear and was killed. Broke our hearts. The statistics are awful. More dogs are lost during the Fourth of July than any other time of year. Lucky for us, Mattie was safe in her crate tucked away in the motorhome sleeping. She seems to be not the least bit disturbed by the noise so we didn’t have to worry about her at all. I have such good memories of the Fourth, and this year added to them once again. Even though we had just one daughter sharing it with us, it was nearly perfect. Stories from the other daughters and grandkids about their day in other parts of the country were perfect as well, so I wasn’t too sad about not having the big family gathering that I sometimes enjoy on this great family day. I know lots of Canon users that will think I am crazy, but I took it back on Monday morning and my check had not yet cleared. I must say that our local Leo’s Camera Shop was great about the return. I just wish that they carried the Panasonic Lumix FX1000 which shipped today. I would have loved to have purchased locally. At least I tried. We will see if I can be happy with this one. As Erin says, nothing will truly replace a DSLR, so it is always a trade-off in one way or another.